PARENTS BEWARE OF ‘SPIRIT ANIMALS’ COMING TO YOUR SCHOOL! POST UPDATED OCTOBER 2, 2017 7:40 P.M. ADDED VIDEO ‘FOR MY MORMON FRIENDS – WHY NO MORE TEMPLES?‘ WILL ADD A LITTLE MORE INFORMATION CONCERNING MORMONISM WHEN TIME ALLOWS. Now I must admit that there were occult themed books in the SCHOLASTIC reading selections back when my children were young, as well, but being fully aware of the dangers of the occult because of what I dabbled in when I was young and not yet a Christian, I never allowed my children to read or watch anything of that nature so as to protect them from being lured into the occult as I had been. (I may at some point in time write about that, so as to make you aware of some of the dangers, as well as the many warnings in Scripture that I will definitely be adding to this post as I continue). …because if you listened to what he said, you can clearly hear the religious/spiritual/occultic spirit that permeates his words. The other videos your child will find to watch in the side bar on YouTube if they see the ‘SPIRIT ANIMALS SERIES TRAILER’ or one similar to it, are videos such as:“Messages From Your Animal Spirit Guides – Review by NewAge.com – Tarot and Oracle Cards.” Or, “How to Find Your Power Animal | Wicca,” or “Totem Tuesday – Finding Your Power Animal.” Can you now see the spiritual danger this new series poses to your child? They also have a website where a child can go and find out what their ‘SPIRIT ANIMAL’ is! (Which I will not share here). I want to take the time now to express my sincere and deep appreciation to ‘STAND UP FOR THE TRUTH!’ for bringing this information concerning SPIRIT ANIMALS to the attention of all their readers by warning about this on their website! –Thank you very much! And now I am bringing it to your attention, my dear readers. I am warning you because I care, and see it as my responsibility before God to make you aware of this so that you might become informed of the genuine occult agenda that is — at this very moment — at work to not only lure your child into the occult, but also seeking to ultimately remove any Biblical teaching you have so faithfully tried to plant into the heart and mind of your child, as God’s Word shows us to do. You can read more and watch the video on my post here>>‘PASSION 2013 CONFERENCE — WILL THERE BE MORE MYSTICISM?’ (NOTE: JUST FOUND OUT THE VIDEOS I ORIGINALLY POSTED ARE NOW ‘PRIVATE’ AND CAN NO LONGER BE SEEN, SO I POSTED ANOTHER ONE, AS WELL AS ONE THAT WILL EXPLAIN ALL OF THIS TO YOU). When I began to see many videos surfacing on YouTube concerning ‘the return of ‘the Nephilim’ and on those who teach that these ‘sons of God’ found in Genesis 6:1-4 are fallen angels and that ‘they intermingled with women and produced a race of hybrids,’ I found the information to be very disturbing and unbiblical. You know that feeling you get when you know what you’re hearing is not Biblical, and the red flags are continually popping up, and certain Scriptures come to mind, but you don’t quite know where to go to find information written by a solid Bible believing Christian who ‘rightly handles the Word of God’ (2 Timothy 2:15) that will confirm what you’re thinking? Well, thankfully, in my search to find some Biblically sound information to refute these teachings, I finally came upon some. Please consider reading the following article I found on the HERESCOPE website that exposes these popular teachings written by men such as Steve Quayle, Tom Horn, Chris Putnam, and others. Sadly, their teachings are being embraced by many Christians today. Now, more than ever before, we need to read and study God’s Word so we are not led into deception! “Spiritism includes trans-mediums, New Age channeling, Edgar Cayse, seances, and Ouija. This form of occultism would also include Satanic groups that worship Satan and who attempt to gain supernatural power by contacting, worshiping, or appeasing Satan and his demons. The occult practice of Spiritualism (Spiritism) is given a new name in the New Age Channeling or trance channeling. Spirit beings, “ascended masters,” deceased humans, or animal spirits allegedly communicate important messages by temporarily entering the body and controlling the voice of a host (channel or medium). Most channelers give the same basic message, man is God.” (The Watchman Expositor, Index of Cults, 1997, http://www.watchman.org/cat953htm (Emphasis in lavender is mine). Something for all of you to think and pray about. Even though this may seem to be off of the subject of ‘Spirit Animals,‘ here’s Part 1 of 2 of ‘HARRY POTTER: WITCHCRAFT REPACKAGED.’ The information in this video series will clearly make my point of how children are being seduced and indoctrinated into the occult. And to top it all off, if you didn’t notice it in the first ‘quick capture’ I posted above, in Part 2 of this video series, you will hear them say (beginning at the 22:14 minute mark), that SCHOLASTIC Inc., is the publisher of the Harry Potter series; they eagerly secured the publishing rights of Harry Potter, supplying the Harry Potter series to all schools! 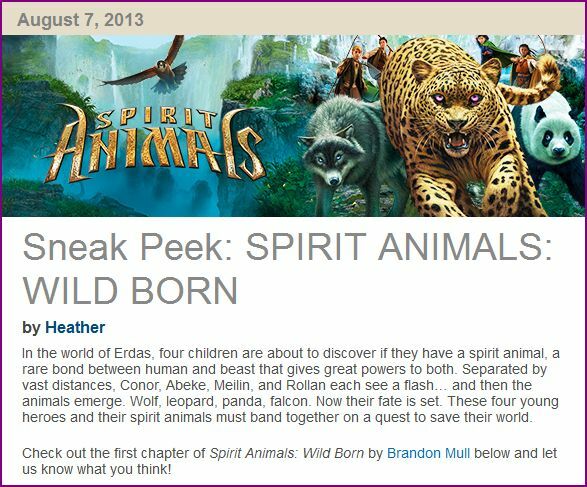 As I was searching for information to help a young reader of the ‘Spirit Animals’ book series who commented on this post hoping she would then clearly see the valid concerns many of us as Christians have about these books, I came across some information concerning the author, Brandon Mull, that I wasn’t aware of when I first wrote this post. I believe what I am about to share with you will raise the level of concerns that many of us who are Christians already have about this series, and hopefully open the eyes of those who think these books are just “harmless fantasy” which encourages children to read, and I will also point out a possible ulterior motive that Brandon Mull may have for writing these books. I can’t judge his heart, but when I found this information I knew I now had the responsibility of sharing this information with all of you so you could be well informed and extremely cautious if you were considering allowing your children to read these books. Next, I decided to check his website. And, as you can see from the ‘quick capture’ below which was taken from the section entitled, “Live Twitter Interview and Live UStream Q&A,” which took place in March 18th, 2010, I found him encouraging his fans to follow him on Twitter. You can also see him telling his fans in Step 5 to “follow Mormon Times,” which clearly goes beyond simply talking about his books! 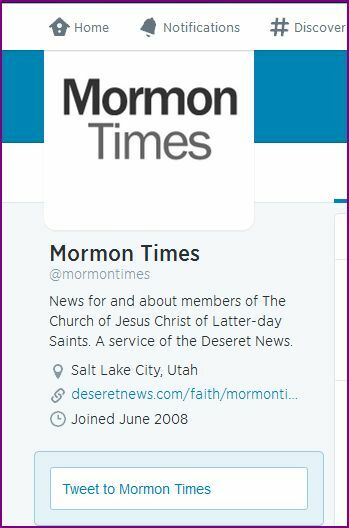 So why is Brandon Mull telling his fans to follow ‘Mormon Times’ if it’s not to lead them into the Mormon church? I can think of no other reason. Can you?? Parents be aware of what your children are reading! Take time to do some research on the authors of the books as well as the messages of the books your children are interested in reading to see if you find people expressing their concerns over the contents of these books. In light of this new information that I have just shared with you in this update, I now encourage you to please watch Christy Darlington’s excellent presentation, ‘An Overview of Mormonism.’ I pray you will take the time to learn from her so that you will know how to lovingly share the truth from God’s Word with a Mormon so the next time they come to your door you will consider inviting them in instead of turning them away. (She also has an excellent teaching series on her channel to help you understand the beliefs of Jehovah’s Witnesses and how to reach them with the truth of God’s Word, as well). Spiritual deception comes through many forms: books, movies, religions, etc. However, God has given us His Word. And to those who are born-again by His Spirit, He gives us His Holy Spirit to guide us into all truth. When I originally wrote this post back in 2013, my main focus was on warning about the series SPIRIT ANIMALS because I saw the need to warn about the lure that these books may have upon children to lead them into the world of the occult. However, even though I did add some good information concerning the teachings of Mormonism, in all fairness, because of a comment that I recently received from a Mormon woman, I want to now take time to add some more videos that I pray will reach many precious Mormons with the truth concerning their teachings compared to God’s Word, the Bible. I am sure that there are many Mormons who are simply not aware of all of the teachings of Mormonism, just as I was not aware of all of the teachings of Catholicism through the many years that I was a Catholic –until I began to read a little Catholic New Testament Bible and God opened my eyes to see the good news of the Biblical gospel! I also discovered many serious concerns regarding the teachings of Catholicism and how they do not agree with what God says in His Word, the Bible, when I began to do some research, which included reading through the Catechism of the Catholic Church, a series that I will get back to writing when life settles down a little for me, and I finish the series on the Alleged Apparitions of the Virgin Mary. We must test every teaching by everyone who claims to speak for God to see if what they are saying lines up with Scripture. (Acts 17:11) Otherwise we are to reject the teaching as false, regardless of who the person is and what the person may claim as a message from God. QUOTE MADE BY JOSEPH SMITH (WILL ADD MORE). “God, himself, was once as we are now and is an exalted man and sits enthroned in yonder heaven. I’m going to tell you how God came to be God. We have imagined and supposed that God was God from all eternity. I will refute that idea and take away the veil so that you may see he was once a man like us and you have got to learn how to be Gods yourselves.” (Joseph Smith, Founder of the Mormon Church/The Church of Jesus Christ of Latter Day Saints) (See video below).